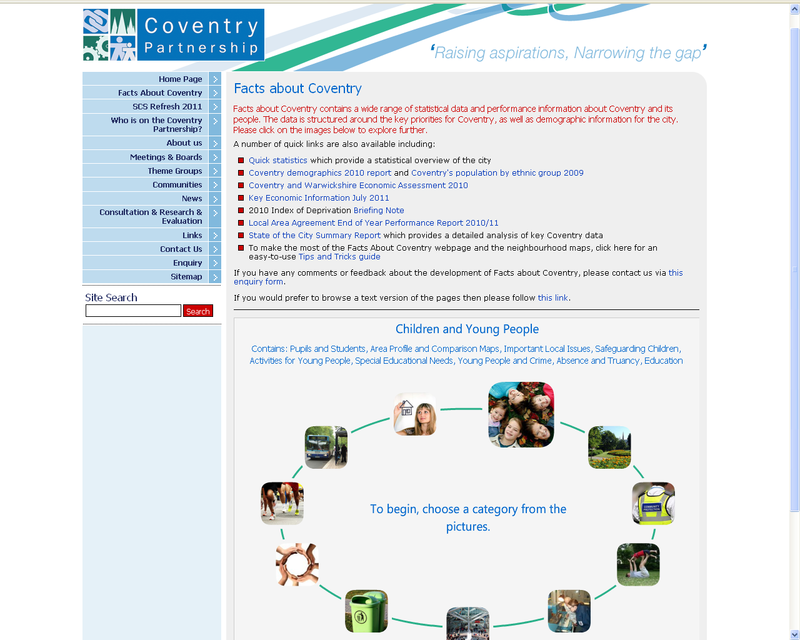 Coventry’s Local Information System, ‘Facts about Coventry’ (www.facts-about-coventry.com), was set up in November 2010 by the Coventry Partnership. It set out to offer citizens and service providers a single point of reference for information about the public services people use, and background contextual information about the place itself. Facts about Coventry primarily aims to ensure Service Managers can improve services through better access to better data. However, the system also serves a wider range of users, including local councillors, civil society organisations or members engaged in the Big Society, local businesses, those with an interest in public issues, students with projects, teachers and more. We talked to Tim Healey, Corporate Research Officer for Coventry City Council to find out more about how they are using Data Packs. Unlike many Local Information Systems, ‘Facts about Coventry’ was not built on an existing system, but was built from scratch. Before the development of this system, the different departments within the authority were used to collecting and presenting their data in different ways from one another, with no integrated system in place. Faced with this problem at the inception of ‘Facts about Coventry’, developers decided the best approach was to buy a system using ‘off the peg’ solutions. After an extensive review of the range of products available, Instant Atlas Server (www.instantatlas.com/iads.xhtml) and OCSI Data Packs (www.data-packs.com) stood out as offering the best solutions. Data Packs were selected due to the comprehensive range of public domain data and reporting they made instantly available, and because they were prepared in a way that enabled the user to load them directly into the Coventry system in a format readily processed by Instant Atlas. Facts about Coventry has proved to be useful to all Partnership data teams and service managers. As Tim explained, it is standard practice in Coventry for service providers to collect and analyse local service information. The contextual information provided by Data Packs is now used to support and strengthen this local data and has enabled service providers to deepen their analysis. As an example, Tim highlighted an occasion where the service manager responsible for reducing the levels of fly-tipping was aware of what factors might be contributing to the problem, but did not have wider information on these patterns linked-to the pattern of fly-tipping. 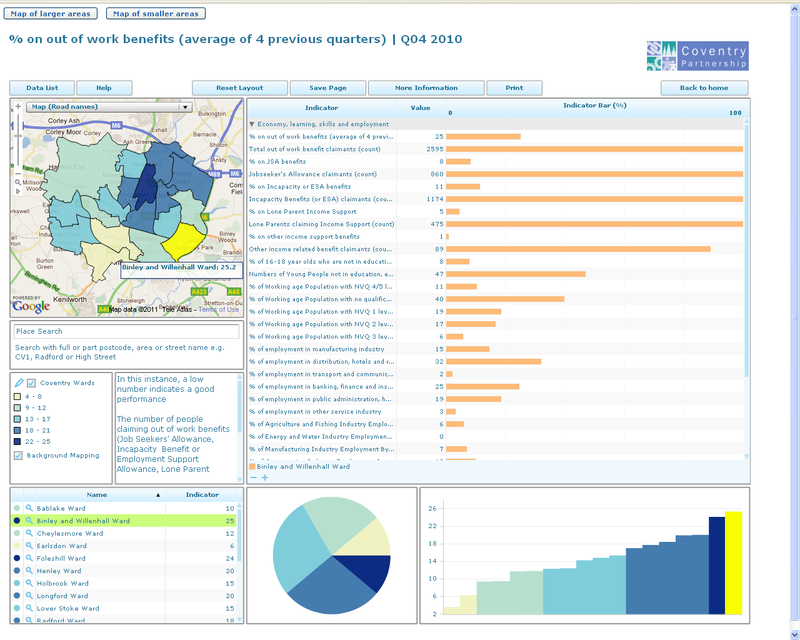 Using the ‘double maps dataviews’ feature – which is part of their Instant Atlas package – Tim was easily able to present the locally collected fly-tipping data to the service manager in the context of social demographic data such as the Index of Multiple Deprivation and data relating to tenancy types. He explained that presenting the data in this way instantly visualised that fly-tipping was predominantly occurring in areas with high densities of private rented sector accommodation which include student-dense areas. Based on this information, the service manager contacted the private landlords directly to remind them of their responsibility to ensure refuse belonging to their tenants was disposed of correctly. Less time spent on data collection has equated to more available resources where it matters most. There have also been notable resource savings in relation to time spent responding to daily research queries. Previously, a data request to the Corporate Research team which may have taken an officer, for example, several hours to respond to, could now take as little as five minutes. A further example relates to the number of telephone queries (which are predominantly from students) to the City Council Corporate Research Team. These have reduced from 35 per week to, on average, less than one. Tim was keen to stress that the significant savings on time and money gained since developing the system has not compromised the level of quality in the data provided by the packs. He explained that, in the past, if there were questions­­­ over a quantitative fact about the City, each partner could come up with a different answer. So, given the proven reliability and up-to-date nature of the packs it is now possible for all Partnership Data Teams and Service Managers to work from the same data source, “…we are now seeing this as the default place to go for the most correct and up-to-date data,” Tim explained.